Often served alongside cocktails or an aperitif, the traditional canapé made from bread or pastry topped with a savoury garnish originated in France, but many cuisines around the world offer their own variety of pre-dinner delicacies. In Italy it is more common to eat antipasti ('before the meal') before the formal dining begins, with olives, vegetables, cheeses and cured meats being ubiquitous on most antipasto platters. 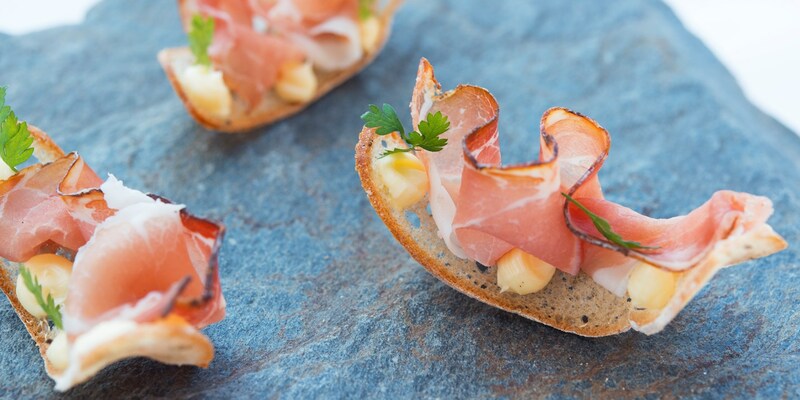 This collection of Italian canapé recipe aims to provide some delicious inspiration for cocktail parties and dinner menus, with finger food certain to impress your guests. The Pietro brothers' Tomato and fennel purée recipe makes a delicate vegetable canapé which showcases two of Italy's most beloved vegetables, and can be a fantastic vegetarian offering if the gelatine is substituted for a meat-free alternative. For another vegetarian canapé recipe try Fabrizio Marino's Gourmet pizza, a take on the Italian classic which is both meat and gluten-free.